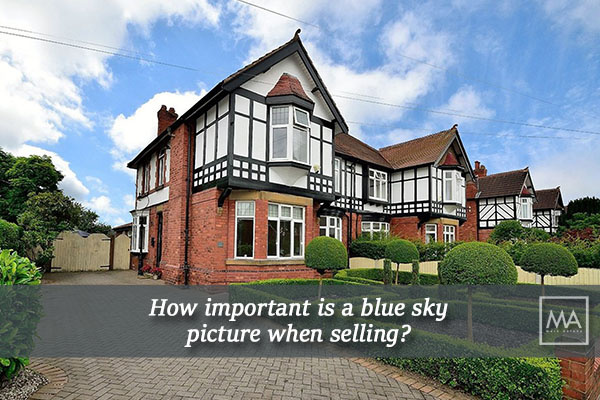 How important is a blue sky when selling? Have you ever bought anything from eBay? If so, you will realise that a search brings up numerous merchants selling the same item, often for a very similar price, and which one do you buy? Probably the one with the most attractive or professional photo. A picture certainly does speak a thousand words, so it is imperative that you get it right. Do you remember that old song by Morecambe and Wise? (oh dear, I’m giving my age away here). Whatever the season, you must insist that your main front elevation photo (and any garden photos for that matter) are taken when the sun is shining and the sky is blue. Of course, it’s hard to predict the weather at the best of times, but any good estate agent, including myself, should be willing to re-take your exterior photos on a sunny day. It’s in our interest as well as yours. Another tip worth remembering is to work out what time of day your house looks best in the sunshine, then you know when to request the photographer. Your photo will look much more vivid and colourful if the sun is shining directly onto the front. Taking a photograph into the sun will be a waste of time. Most articles you will read suggest that your front external photo should represent the current season. I think this is quite a controversial topic. I’m going to stick my neck on the line here and say that I disagree with this in some respects. Let’s say, for example, that your front garden is a stunning array of flowers and foliage in the summer… why wouldn’t you use that photo, even in winter? I don’t know about you, but if I was house-hunting and trawling through hundreds of property ads in the middle of winter, a beautiful garden would catch my eye. Surely the whole point of the main photo is to grab your potential buyers’ attention? Why then, wouldn’t you show it off at its absolute best? Taking your front photo at the best angle is paramount to a good shot. I like to think of the front of your house as its face – now ask yourself this… would you upload a photo onto social media which emphasised your big nose or double chin? Probably not, and it’s just the same for your home. I recommend that you walk around the perimeter of your property and take some practice shots at varying distances. Choose a photo that shows your house and gardens off to its absolute best. If you are lucky enough to have a larger property, perhaps with land, you could even consider hiring a drone to take aerial shots. Have you ever seen one of those property photos which looks more like an ad for their car? My advice would be to move your cars down the road when the photographer comes. Not only can they obstruct the front of the house, buyers could also make judgements on you as a vendor, just from the make of your car. The last thing anyone wants to see on a photo is your bins. There is categorically no place for bins, recycling boxes or junk in your front photo. I realise that they are a necessary part of our lives, and we all have them, but they don’t belong on a photo, bin day or not. I would love to hear your feedback and any thoughts or ideas you have. 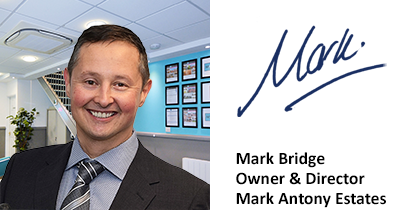 Please send me an email to: ma@markantonyestates.com - in the meantime, all the best!